This full flavoured premium bitter has a rich, fruity aroma. Brewed using generous handfuls of choice Golding hops, it has a perfectly balanced bittersweet, malty taste with a long, dry and bitter finish. 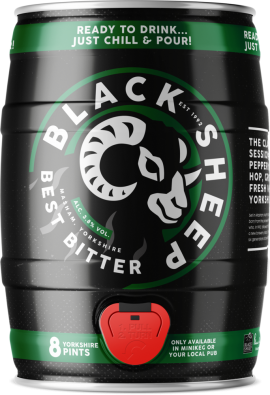 Black Sheep Ale is brewed with a large helping of Golding hops which lend a fruity flavour reminiscent of Seville oranges which, together with the warming full bodied malt flavour, stand up well to all red meats and most cheeses such as Wensleydale and Stilton.